Spring remains elusive in so many parts of North America, but here in France, especially in the Southwest, it has arrived like the TGV fast train in the Gare d’Agen- at full speed and then slamming on the brakes. One day it is cold enough to huddle by the wood stove; the next I am outside in a t-shirt arranging the garden. Now after three solid weeks of luxurious sunny and warm days, the dreaded Giboulées de Mars have arrived. The Giboulées are the Lion in the old adage—“March comes in like a lion and out like a lamb”. High winds upended the sturdy bistro chairs in the garden; heavy rains battered the skylight above my bed too early this morning; hail comes knock the fragile blossoms off the plum trees; umbrellas and market stalls are sent sailing across the market squares. That’s March for you. Waiting for the Lamb to take over, means weathering change in my kitchen, too. This unpredictable weather engenders another sort of upheaval. I begin to liberate myself from slow winter cooking—my beloved braised meats and slow-roasted vegetables. I crave the first peppery greens like the new root radishes we eat with creamy spring butter. I want a Spring Soup—not long simmering but quick and fresh and full of life and sprinkled with a crunch of seeded croutons. And most of all I am craving spring duck, those thick red meat steaks called magrets grilled on the stove top, then served under a verdant blanket of fresh green onions, tender aillets (those first green garlic shoots), pickled guindilla peppers, and the first new mint leaves from my sleeping garden. It takes just minutes to cook, and chopping the greens happens at the same time. Put it all on a thick toasted slab of pain de campagne with crisp slices from a head of Sucrine lettuce drizzled with some walnut vinegar and sunflower oil. 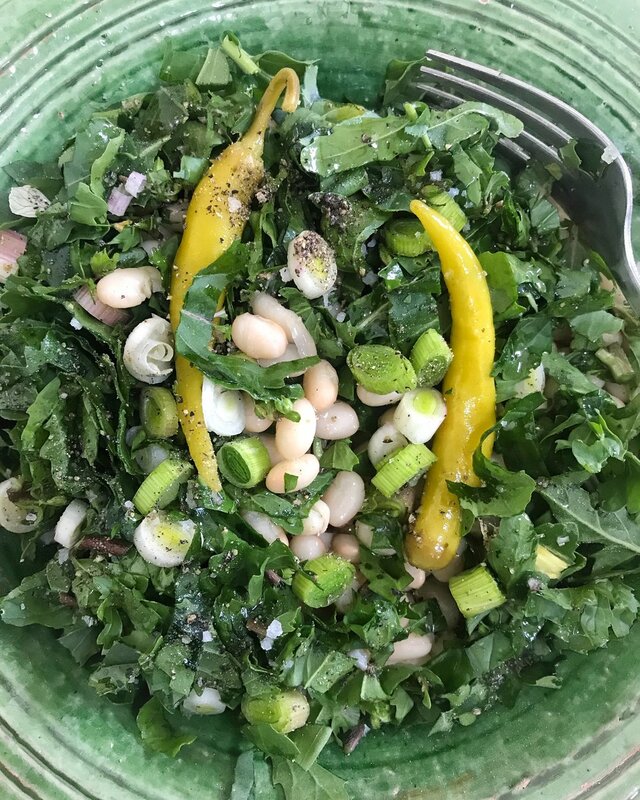 Here, I used the same combination of spring onions, green garlic, guindillas along with some roquette leaves and white beans, a drizzle of oil, coarse salt and freshly ground pepper. It couldn’t be simpler and so deliciously Spring! Cooking like this reflects the seasons-the global turning of the days, but also my own personal season of renewal, a time to reassess my direction-both in the kitchen and out. I am busy on projects, finishing old one, starting new ones. I cook to reflect the Spring frenzy of ideas that pushing out of a quiet restful winter. I eat with gusto and savor the new tastes—sharper, lighter, fresher. One big Spring idea is to start teaching more online, using new resources to share the good food of Gascony with you. Cooking classes, shopping advice, travel tips all wrapped up in a personal package of videos, ebooks, and in person gatherings. If you are interested in being part of a pilot project, make sure to sign up for here. La Croustade. Think crusty, crunchy, and sugary pastry. Aux Pommes. Think juicy, sweet, and acidy apples. This is the one sweet Gascon recipe you need to know when you are at home or traveling. With only 6 ingredients and a hot oven needed, you can turn this bébé out in a few minutes, pop it into the oven for 30 min, and then sit back and rest on your French laurels. For this version of a flaky and butter rich pastry I turned to my old French books for the basics of a puff pastry. Then I did a little internet search. My friend Lucy Vanel of Plum Lyon popped up all over the place for a simpler version of the classic puff pastry- a recipe for a ‘Fast Feuilletage’ or rough puff pastry. I knew that this was the perfect jumping off point. Read Lucy’s original recipe here. After several test drives, I reduced the butter a bit to make my croustade pastry as simple as I could- equal parts flour and butter, water and a pinch of salt. The filling is half a dozen great apples with a sprinkle of sugar and cinnamon and a splash of armagnac. Ready. Set. Go! 6 sweet, juicy, and tart apples. Try old baking varieties: Jonagold, Winesap, Macintosh, Newton Pippin, etc. Optional: A generous splash of armagnac (brandy, calvados, rum, etc)Mix the flour and salt in a large bowl. Using a small knife or your fingers, break the butter into chunks. and add to the flour. Using your fingers, work the butter into the flour and salt leaving lots of different sized pieces- from almond size to peas to lentils. This should be a very coarse mixture. Make a well in the flour and butter and add the cold water. Mix quickly with a large spoon until you can form a ball. The pastry will be very soft. Feel free to add more water as needed. Turn the dough out onto a well-floured board or surface and knead just enough to form a smooth ball. Roll the dough out into a rectangle about 1 cm or 1/2″inch thick. Make sure to use enough extra flour for the board. Fold the rectangle into thirds; roll out into another rectangle; fold the rectangle into thirds; repeat two more times. This is an easy version of puff pastry. Cut the last rectangle in half using one half for the top and one half for the bottom. Roll the bottom half out until it is 6 mm or 1/4″- place on a half sheet or cookie pan lined with parchment paper. Roll out the top and let it rest while you add the filling. Mix sugar, cinnamon, and armagnac together. Let sit while you roll out and shape the dough. Place the apple filling in a thin layer across on the surface of the bottom pastry then cover with the top pastry. Bake at 200’C or 400’F for 30 minutes or until very golden brown. As soon as you can handle the pan, slide the whole croustade off of the parchment and onto a wooden cutting board. This helps keep the bottom pastry from getting soggy as the steam escapes into the more porous wood. Let cool, cut into big squares, and serve with crème fraîche, vanilla ice cream, or a drizzle of salted butter caramel. Give this a try all you recipe testers and let me know how it turns out. You can substitute other seasonal fruit like pears or plums. Take a picture, Instagram it, and tag me @katedecamont. There is a second croustade in this part of France- a Croustade Gasconne and is made with very fine layers of pulled pastry dough, apples and armagnac. If you want to learn how to make both these special regional desserts, join Molly Wilkinson and me for a 5 day Sweet Pastry Adventure at Camont. Living a seasonal life is relative to where you live. After a young life of living in tropical and aseasonal Hawaii and later along the moderated Mediterranean California coast, I fumbled into the oceanic influenced four seasons of Southwest France. Here at Camont, my days are very much dictated by the seasonal flow from a mild and wet winter to a wetter and warmer spring, through the hot and sunny summer months and circling into an extended autumn that gradually cools down and back to winter again. Eh Voila, les Quatre Saisons! My four French seasons are most reflected around the house and in my kitchen. Although I remain delighted with Spring and the festive social Summer months, it is now in the middle of Winter that I feel the slow turning circle the most. I hang heavy brocade curtains over the drafty doors, stack the split wood under a dry cover, and gather kindling for the morning fires. Extra duvets are piled on the foot of the beds; the laying hens are let out of their cozy coop after my first cup of coffee; and I make sure to feed the flitting songbirds and paired tourterelles that flock to the seeds and fat balls that hang from the fruit trees. This preoccupation about feeding extends into my kitchen, of course. The holidays are over, at last. Everyone, at least the media, is concerned about starting afresh, or watching their weight and getting off to a healthy new year. I’m no different but I miss the large and orchestrated meals of festive summer and the grand school lunches we prepare during cooking courses. I actually cook less in the winter months, but with more restraint. Like this very lean leek soup I made yesterday. The idea of something put on to simmer all day can be a mythic goal. What about a simple soup that only needs to cook for 30 minutes are so? Something without a rich stock, or the the heavy cream and butter of the holidays? Every season is Soup Season in Southwest France. When I first came to France, every meal I ate in a rural French home featured soup- breakfast, lunch or supper. Today, French families still gather to souper in the evenings or at grand-mère’s house for Sunday lunch. Passing a tureen around the table or one person standing to ladle the soup plates-those flat rimmed bowls-is a familial way to eat together. This Simple and Lean Leek Soup will start off your Winter cooking season like a savoury tonic. Let’s start at the market. No French Winter market is complete without bunches of beautifully blanched leeks with long white stems and deep green leaves. The classics—Leeks Gratin, Poireaux Vinaigrette, and even the fancy sounding Vichyssoise, are nothing more than a simple tribute to this sweet allium. One of the first soups I learned to make in France, it is easy to cook just a couple servings, at least enough for two and a bowl leftover. Someone told me they find leeks sliced, washed and frozen in their supermarket. So, whichever way you go, fresh or frozen, think of this simple soup as beginning of a meal or the simple accompaniment for an omelette. For my Southern hemisphere friends, just chill this soup, add a dollop of crème fraîche, and some chopped chives when you serve it. eh voila! Put the oil in a 2-4 litre/quart saucepan. After slicing and washing the leeks, add the leeks to the pan and turn on the heat. Stir the leeks and oil until they are well coated and then add the water. Add the bay leaves and let simmer 30 minutes until the leeks are very tender. Add enough salt to taste, but don’t over power the sweet leeks with too much salt. Garnish the soup with some chopped up guindillas or pickled peppers, a drizzle of walnut or other nut oil, and splash of your favorite hot sauce and a cracking of fresh black pepper. I avoid using a strong stock as the sweet leeks are enough to flavor the broth. Pie. Why bake Pie? In my book, (that big imaginary volume called “The Big Camont Cookbook”) Pie or the French version-une tarte- is the most rewarding of all treats. The smell of the baking butter, the pastry crunch, the butter, the slightly sweet and soft texture of cooked fruit, and the perfectly happy butter pastry crust are reward enough for a short time spent in the kitchen. This sweet pie, essentially a classic sweet potato pie, was created for a dinner of friends last week. In my last minute ‘let’s make it happen’ madness, I consulted a few online recipes and then made my own path. I roasted some sweet potatoes (amazingly grown in my own garden this summer!) and tossed in the last remaining quince from the fruit bowl. I hate that things go to waste, that there is one small, measly, remaining-something-from-a-large bowl. I always try to use up the last lemon, the lone apple, the meager bunch of carrots bought last week. So along with the potatoes that I cut in halves and placed face down on a sheet pan, I placed the halved quince as well to roast. When asked to tell why I do what I do, what makes me get up every morning, or why I bother to write this all down, I think of something as simple as that gesture of placing the last quince in the pie. Almost instinctual, a learned habit of looking at what’s around me, I enjoy the process of thinking how one added new element elevates this simple recipe found on a thousand sites and in as many kitchens this Thanksgiving season. Making a recipe your own happens easily when you stock your kitchen with thoughtful products. Two of the four quince I bought at the market became part of a kale salad that John D. made when he was cheffing his way around my kitchen all last month. One quince got poached in a light syrup and has been steeping in the fridge; I will now add that to the some holiday chutney. And that last quince that I baked alongside the sweet potatoes added just enough perfumed plus to the filling. Other than using an already open 14 oz. can of condensed milk (with enough sugar for my taste) I add no additional sugar. What a happy accident! The summer sweet potatoes and the quince, brightened with a squeeze of lemon, a splash of armagnac/vanilla extract (I make my own), and a couple farm fresh eggs were enough a perfect marriage. I added some fine cornmeal to the flour and butter to make a slightly more textured and nutty crust. Soon this pie was my own—inspired by tradition and elaborated by my own touch to create a dense rich dessert as festive as my table. Although I didn’t ‘follow’ a recipe, I do make note of my ingredients. Give this a whirl and add your own touches! Mix all of the ingredients together and whisk or blend together until smooth. Pour into pastry crust and bake in an moderate oven at 350’ for 45-55 min until the filling is set and barely jiggly. Let cool or refrigerate overnight, serve with whipped cream, ice cream, or crème fraîche. Enjoy and give thanks! *Steep some vanilla beans in armagnac, add some rum, and orange flower water. Let sleep together for awhile. Eh Voila- Le Secret! Like a magical breath of fresh air, this sweet finish—a perfect Pruneaux and Armagnac Soufflé— transformed our Sunday lunch into a classic French cliché. The hours passed at the table with good companionable friends began with aperitifs (Pousse Rapiere for all!) rolled into remarkable local wines, amuse bouches, fanciful starters, and precisely prepared main courses followed multiple desserts. It truly was Classic Gascony! I began thinking about why this photograph, admittedly not the best I’ve ever taken, whetted so many people’s appetites? Was it a nostalgic wave for the 80’s soufflés I remember? Maybe the darling Limoges porcelain and paper doily presentation? The dollop of creamy golden ice cream settling into the hot puff of edible air? No, I believe it was the magic combination of two words that push people over the edge. Pruneaux. And. Armagnac. The prunes d’ente (grafted plumes) date to the Crusaders who returned with them from Syria to be planted in the monasteries of the Lot Valley. Once cooked and dried they are transformed into pruneaux or prunes. Not only a delicious dried fruit, they are used in regional cooking and often paired with meats, game, poultry and used in sweets. I remember when a sage distiller once told me “Armagnac loves silence.” I think of that invisible ingredient each time open a vintage bottle that someone has carefully kept for 40 years or more in the silent chais of Gascony. I think of that when I add a measure of the distilled wine to my recipes. Like a secret ingredient, too, Armagnac adds the depth of candied fruit and floral perfume, cacao and vanilla aromes, pear, tobacco leaf, and prunes. And that is why the Gascon marriage of prunes and Armagnac stands the test of time. Shhh. Remember, Armagnac likes it quiet. I keep thinking about how French cooking differs from other cuisines. Not better. Different. I have learned this preparing many hundreds of meals at Camont. The two elements that define French cuisine, especially Gascony cooking, are restraint and celebration. Cooking with armagnac begs for restraint whereas I add the golden fleshed sweet prunes with abandon and celebrate the simple fruit. These two ingredients as well as the approach are a good match and compliment so many dishes- Lapin aux Pruneaux is gently flamed with a Hors d’Age blend, a splash of fruity Colombard Brut livens the plums for that special soufflé, and a tulip glass of vintage 1970’s Armagnac warms in your hand over a long conversation after dinner. Interested in learning to cook with Armagnac and Prunes? 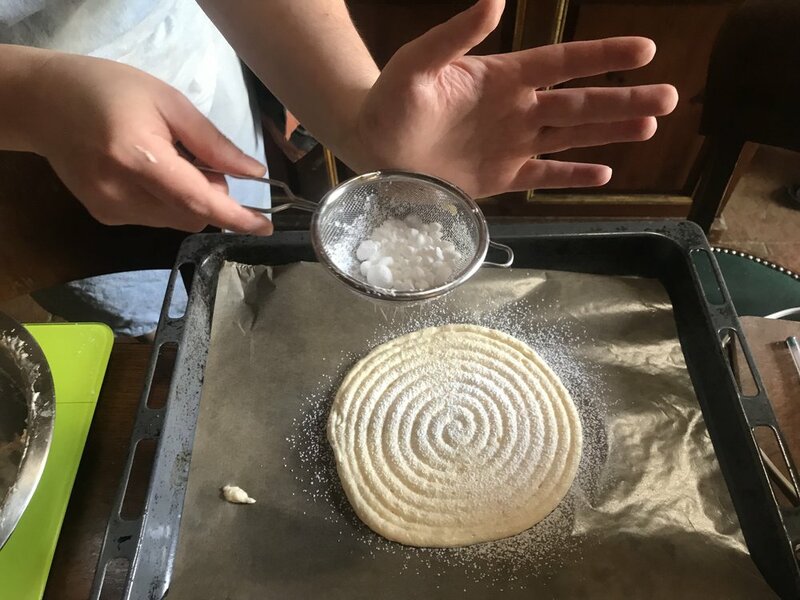 Sign up for a week of Classic Gascony Cooking Classes in 2019. Bookings now open here. Hungry for French Prunes? Try these. Recently I asked some of my guests what was the most surprising thing of their Insider’s Gascony week. Was it the abundance of good food? Or the little know and fabulous Côte de Gascogne wines? The magic of Armagnac we saw being made and bottled? The delightful picturesque stone villages of Gascony? No. They had one answer. Why was I surprised? I know how lovely the French countryside is. I know that from the mid-19th Century painters of the Barbizon School of Landscape Art through the Impressionists of the Late 19th-Century and right into the Instagrammable 21st Century, the rolling seas of blonde wheat and vibrant sunflower fields bordered by dark green forests have defined the French Countryside to a fault. Does it look like a postcard? Yes. But beauty is not a cliché. So why was I surprised? I know how lovely it is here—spring, summer, fall, and winter. But somehow in all the things I write, the food I cook, and the photographs I post, I forgot to tell this led this group of four well-traveled souls to expect beauty. I have failed miserably! So I take this as little reminder and invite you, too, to look up and out as you search for your next culinary inspiration. Check the weather by looking at the clouds and the direction of the wind instead of at an App. Take an extra moment to pull off the little two lane roads and look, really look at the rows of freshly furrowed soil. Image what will be planted next after the harvest of dry rattling cornstalks. And share that. Create those connections between soil and seed, and the food that is harvested just for you to buy at the weekly markets. Gather in the seasons into your own kitchens and celebrate the turning from one delightful expression of summer to the first drawing in around the Autumnal fires. I’ll try to remind you more. And to also remind you that a trip to Camont to sook through the seasons is an investment in your own memory bank. Taste spring as it jumps from your market basket to our table and we celebrate another great season in the Kitchen at Camont. 2019 Class are booking now. This photograph was taken 10 minutes from Camont on a June day in 2018. “In the time of the Lion…” begins one of the evocative passages about summer food collected from around the Mediterranean by the late writer and artist Patience Gray in her vintage autobiographical cookbook ‘Honey From A Weed’. This August, I’ve been dipping in and out of her world reading about, and then cooking, the simple foods of Catalunya, Puglia, and Tuscany. Written in the 60’s and 70’s when Ms. Gray and her husband sculptor Norman Mommens lived in the rough outcroppings of rural villages never far from the Mediterranean Sea, and published originally in 1986 the book is like a good vintage shop of foods and meals, esoteric ingredients, and the everyday familiar foods. It is this August summer bounty from markets and gardens that inspires a feast of paella that I cooked for friends here at Camont. In a story about some time spent in Vendrell near Tarragona, Spain, Gray describes an outside kitchen where Anita, the Catalan cook who inspired Irving Davis to begin his landmark collection of recipes; she later edited these recipes after his death in 1967 in A Catalan Cookery Book: a collection of impossible recipes, 1969. My own outside kitchen, shaded by a lacy acacia tree has a Portuguese beehive oven, a Spanish grill, and a French gas tripod. It is often the inspiration for a certain kind of meal; one that I like to cook where friends can gather, move, and work around the outside tables in the garden. Who knows, maybe they'll do some weeding? Whoever does show up first gets put to work so-Colin soon has a fire going; Julia and Maurine set up the bar and apéros of house-made Spanish style vermouth, gin-tonics, and the ubiquitous icy cold rosé; Justine and Vicky make the salad and laugh at my brocante salad spinner; Steph arranges the dishes and a pile of serviettes; Steve sorts out the chairs, and in between talking and catching up, I make Anita's Paella. The Paella recipe is on page 84 of Honey from a Weed, a simple one page explanation that is easy enough for even a beginner to follow. I left out the meat and chicken this time and used all fresh seafood: shrimp, prawns, mussels, and langoustines. Using 100 grams of rice per person and 2 liters of broth made from the shrimp heads and shells, some little fish, and seasoning, there was ample servings for seconds all the way around. The rice only takes 20 minutes to cook over the hot fire, and gets a nice crusty edge where it hits the flames. Here’s a little slide show of making Paella in the Outside Kitchen at Camont. For more information about Patience Gray and her cooking, join me on Facebook as I moderate the Saveur Magazine Cookbook Club this month and read the book, make the recipes and meet like-minded cooks. I’ll also be posting recipes and other inspirations from Catalunya next week on my Instagram Stories. Intrigued and want to know more about Patience Gray and her books? Read Adam Federman's great biography Fasting and Feasting: the Life of Visionary Food Writer Patience Gray. All books availabe here. With our new laying flock at Camont getting up to full summer speed, I am gathering 5-7 eggs a day. Yes! that's 35-50 eggs a week; 3 to 4 dozen a week. Dozen's of fresh farm eggs from very free range and well fed hens. Friends benefit, students get lots of practice, and mostly I am inspired every day to make something with eggs. From herbed omelettes to poached eggs at breakfast; golden yolky pain perdu or French toast and clafoutis with fruits for Sunday; Spanish tortillas and Italian frittatas for supper. But best of all they are one of the solid bases of our special French trilogy for pastry. Think of all the wonderful pastries we make in France- from choux puffs and eclairs, to crème patisserie filled tartes, to sugary egg washes on my rough puff croustades. Quatre-quarts or pound cakes leaven and glow golden; a foaming eggy Sabayon to ladle over soft fruits; and even simple lacy crepes owe their special flavor and color to our deep golden yoked eggs. When pastry chef Molly Wilkinson of Toffee Bits & Chocolate Chips came for a visit this spring, she fell in love with our fresh produce at Camont and we hatched a little plan to share her skills and creative take on Classic French Pastries. You can read more about a Weekend Pastry Adventures with Molly here in the Kitchen at Camont here! Here's Molly whipping up some more sweet treats at Camont! Take a look and join us in August 17-19 at Camont. It doesn't take much to please some of the people some of the time, but when I teach my Camp Charcuterie students to make these little pies, everyone is happy. I teach them as a way to use the trim, the little bits of pork, or a spare duck breast by wrapping them in a sturdy and delicious hot water crust. Crusty, steaming, golden with an egg wash with juices flowing over the edges, my pies are deliberating home-made looking. Perfection is for shops. I want mine to look like grand-mères kitchen. So don't be nervous, take the plunge and make a few pies today, you'll be happy at lunch tomorrow. This Hot Water Crust is a good all around recipe for all kinds of savory pies. It absorbs some added fat from the meat, goes crisp and crusty on the outside, holds up to staying safely in the refrigerator after it's baked. Weigh and measure the first 5 ingredients (meat, onion, liver, salt and pepper) and mix together. Grind on a 6-8mm plate. Add the egg and cream and mix together well until very sticky. I used small ramekins and mini-terrines here all holding about 250g of mixture. Roll out the Goldilocks pastry, not too thin, not too thick, and line the terrines pressing the pastry into the bottom corners. Reserve enough pastry for the tops. Fill plumply with meat, brush the edges with egg wash and place the pastry lid on the top. Seal the edges well by pressing with your fingers or a fork, making a steam vent in the center. I use a chopstick! Finally, brush the top with egg wash.
Bake at 200'C/ 410'C for 1.5 hour and make sure the crust is deep golden brown all over- the bottom, too. Internal temperature must reach 75'C/ 165'F for at least 10 minutes. However, a large terrine or pie might take 2 hours. Set aside to cool for 20 minutes, remove from the terrines, then wrap in parchment or other paper and place in the refrigerator until needed. These little plumb pies also freeze well and can be taken on a picnic and eaten at room temperature or reheated.